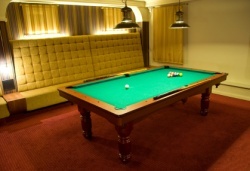 Ideally, you could afford to hire experts who know how to move anything weighing more than a hundred pounds; a pool table can weigh up to ten times that amount. And it's finely calibrated, to the extent that you'll probably notice a change in your gameplay after you finish moving a pool table without experts. So perhaps you could at least try to hire someone just to reassemble the pool table once it arrives at its destination. Even disassembling the table into components still leaves you with some very heavy pieces to move. So the more friends you can talk into helping you, the better. You're going to need a staple remover or puller, plus a flat-head screwdriver, and whoever removes the staples ought to wear goggles or safety glasses. You'll be surprised by how much of a pool table you can take apart So put on the goggles or safety eyeglasses and prepare to remove the staples from the pocket straps. Then remove the bolts underneath the rails, which will be able to pop out once you take out every bolt – the average will be three per rail. Pull out one rail at a time. Next, remove the felt. If it's stapled to the table, you can use the staple remover. The felt might be glued to the table, in which case you'll need to pull it off very gently. Be especially careful around the pockets, where the felt's most susceptible to tearing. After that's finished, ask your friends to help you turn the table over. Then you can lift the slate off the frame of the table by removing the screw from each corner of the slate from the slate using a drill with replaceable screwdriver heads. These screws might be hidden under plaster or beeswax. The latter can be dug out with a screwdriver, but plaster calls for a carbide drill that you'll need to use as slowly as possible. Finally, have your friends help you turn the frame back over and take off the legs. Then you'll want to wrap up each of the pieces so the wood doesn't get damaged. Carry each piece to your moving truck. Once you get to your destination, do the reverse of what I've instructed above. This is one of the harder things to move, so I recommend you try to find the funds to hire movers for the job. Or at least hire someone to reassemble the pool table once it arrives at its destination. If you can't pay for someone else to move, see whether you could get five to ten friends to help you. Best of luck moving your pool table.